The Wife of the Governor of Edo State, Mrs Betsy Obaseki has called on Christian women all over Edo State to rise up and build the nation through positive thinking and prayers. 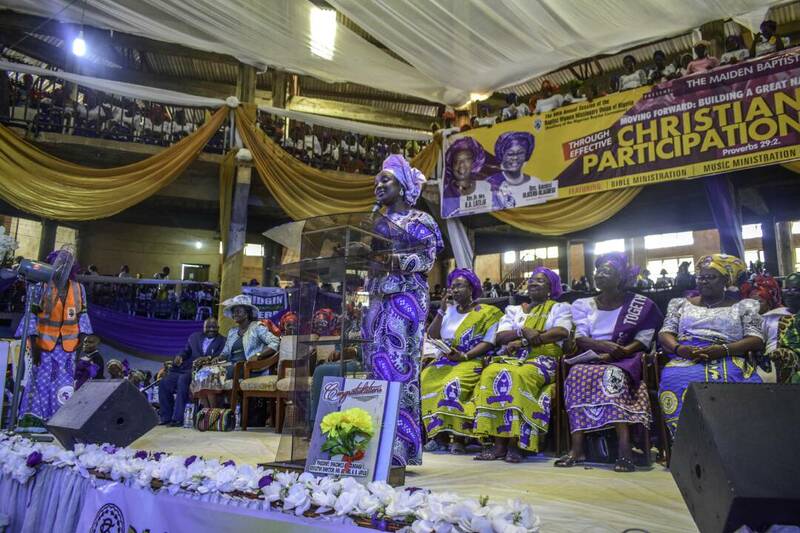 Making this call at the 99th Baptist women convention held at the Edo State Baptist conference complex, TV road in Benin City, Mrs Obaseki urged Christian women to participate in politics so as to be part of nation building, while urging them to maintain a positive mindset towards Nigeria. The Wife of the Governor further explained that Nigeria is like a jewel in the hands of God, as he has great plans for the country, while advising them to shun all negative remarks that have been made about the reputation of our country as it is with our hands that Nigeria can be transformed into a nation of excellence. She stated that the theme of the convention, “Moving forward: building a great nation through effective Christian participation” is an indication that the Baptist women are forward thinking and ready to be a part of building Nigeria into a nation that will be an envy to other nations around the world. “Don’t join people who talk bad about Nigeria, if you are a Christian you will be grieving the holy spirit when you do so, because He knows the great and glorious plan God has for this country and He expect you as Gods child to agree with your Father and speak the words He speaks about you, not to speak the opposite words, the negative words, but to speak what your Father says about you. We all know as christians that you dont speak bad to your children, you don’t call your children bad names, because what you call them is what they become true or false (true) Same for our Country, speak good about Nigeria, don’t fall into that temptation of speaking negatively about this country. “You acknowledge the bad things, it grieves you, it should lead you to pray and call on the Lord to bring his mighty hand quickly and do the work of true change and transformation to glory. Earlier in her address, the president of the Baptist Women’s Missionary Union of Nigeria, Deaconess Adebisi Olateru-Olagbegi expressed her gratitude to the Baptist women for being a part of the convention while explaining that the convention was timely, considering the present situation of the nation. She further explained that in biblical days, women were used to transform the lot of their nation, citing, Esther, Deborah and Abigail in the Bible. Mrs Olagbegi further urged the Baptist women to emulate such women and be a part of nation building by being patriotic through support for genuine participation in national issues. Meanwhile, Mrs Mary Aplaka thanked Her Excellency for her participation and support, praying God to grant her a successful tenure.